Stephen Booth is a multimedia Visual Artist exhibiting internationally for nearly twenty years and is represented across Canada. His works range from large scale permanent installations to small scale temporary works. 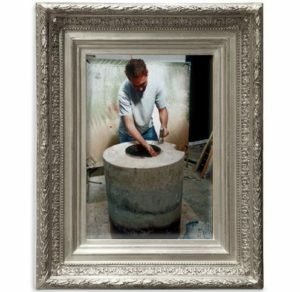 He has used a wide variety of materials in his art including bronze, clay, concrete, metal, paper and ready-made objects. Booth’s figurative abstractions are predominantly of Bronze and solid fired clay. He was born in Edmonton Alberta, he received his Bachelor of Fine Art majoring in Sculpture and Drawing from the University of Alberta He attended the Edinburgh College of Art where he was awarded his Masters of Fine Art in Sculpture. He is currently working and residing in Vancouver on the west coast of Canada. You have an interesting collection of work. This work is riveting, creative, warm and above all contemplative in a subtle way. The artist’s heart, soul and very human presence is in every piece. I have a lot of time for this young Canadian Artist who personifies what great art really is. As his career progresses we will only see more and more of Stephen Booth’s art. Thank you for that wonderful compliment! I am speachless… Which is quite uncommon.